How a teenager can become a published author and how a parent can help. In this episode of the Dollars and Sense podcast, host Carol Topp is joined by teen author Rachel Coker. In this podcast Carol Topp, CPA discusses record keeping in a business, helpful software and some tax tips fro writers. Do you have a writer or budding author on your Christmas list? Carol Topp, host of the Dollars and Sense Show podcast has some gift ideas for the writer on your shopping list. 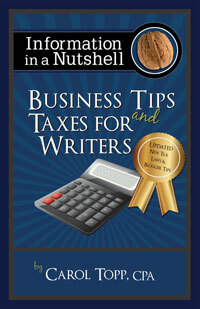 Writing, researching and publishing a book has expenses tied to it and tax consequences.